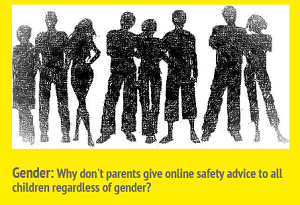 Safeguarding Essentials – Parents' Advice on keeping safe online - could do better! Parents' Advice on keeping safe online - could do better! Although nearly half of all nine year olds have a smartphone and 79% use a tablet, 43% of nine year olds said they were not shown how to stay safe online by their parents or carers. It seems that parents start talking to their children about online safety too late. They are giving advice to 2/3 of eleven year olds, then backing off so that by age fifteen, less than half of our respondents said their parents showed them how to stay safe. Yet it is in the mid-teens that young people are at most risk. Adrienne Katz, director of Youthworks Consulting which runs the annual Cybersurvey, now in its 10th year, said "Parents should be encouraged to start talking to small children about safety and to keep at it as their child develops. Teens don't want rules, but they need relationship skills and your support when things go wrong." Data is from Cybersurvey 2016, gathered in November/December. 2000 children and young people aged 9-16+ took part.